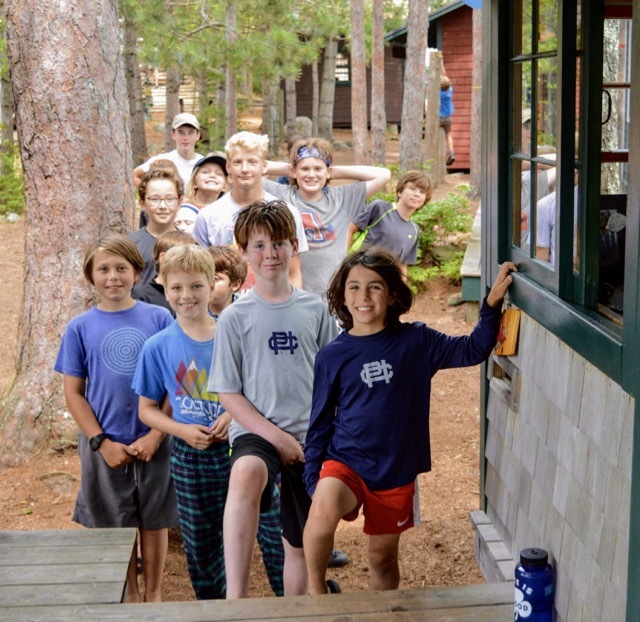 This entry was posted in views from camp on June 24, 2017 by Pine Island Camp. July 15, 2016 was a day packed with eagerly anticipated activities. 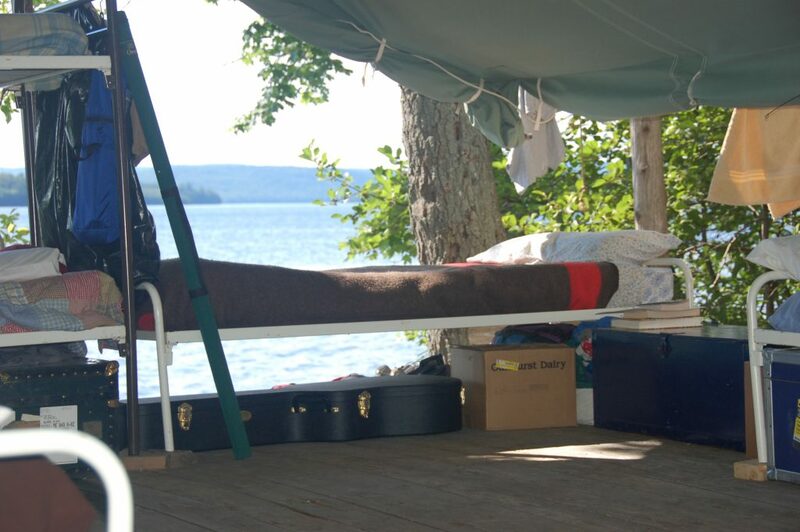 All campers and staff were in residence for only the second time all summer; the annual camp photo would be taken just after lunch; it was the day of the Regatta; and that night instead of campfire it would be Club Honk, a musical extravaganza, complete with a stage, elaborate lighting, and supergroups. 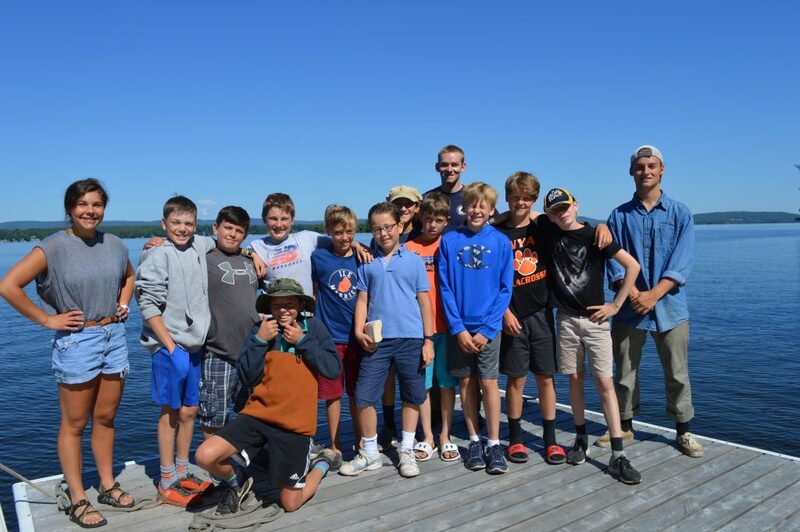 However, perhaps the most eagerly anticipated event would come at the end of the regatta – the annual attempt by the burly Expedition Campers paddling the war canoe to get a camper up on water skis. The search had begun earlier in the day for the perfect skier – he must be the smallest camper available who has some experience in the sport. Impromptu interviews discovered a promising candidate in Dimitri C., a first-year camper from Paris. Dimitri seemed remarkably calm in spite of the weight of history – success in all of the three previous attempts – on his young shoulders. He seemed confident in the strength and stamina of the men of Expedition Camp. Dimitri donned his life jacket and two staff members helped him get set up in the cove with two ancient water skis while the paddlers attached the extra-long tow rope to the war canoe and prepared to paddle. A large crowd gathered on the beach and chants of “Di-Mi-Tri!” rang out. Would it work again this year? 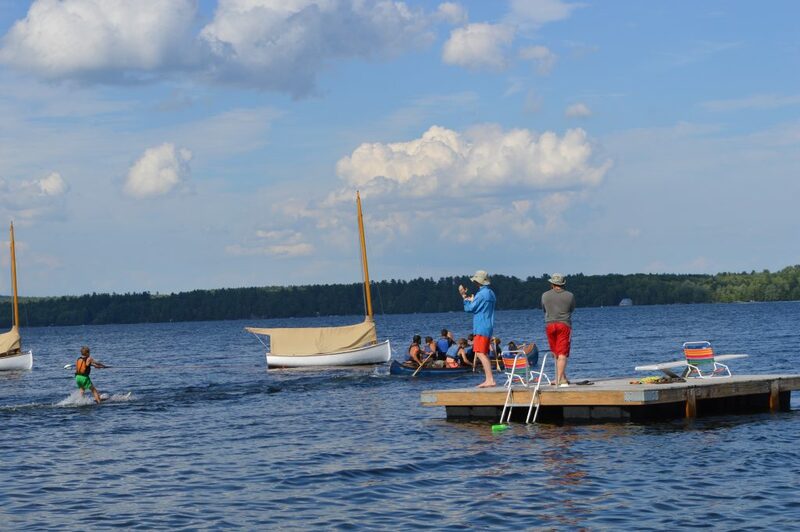 Then they are off…paddling madly…the tow-rope comes taught…the attending counselors give a push…and…his skis nearly make it to the surface but he pitches forward. The crowd groans, Dimitri waves undaunted, and the war canoe makes a long loop back around to start again. Again the big blue Old Town surges forward with cries of “Stroke! Stroke”…the line comes taught…the skier wavers briefly but leans back and…he’s up! Huge cheers from the crowd on the beach who watch as Dimitri skis out across the lake… further and further…getting smaller and smaller…far enough so that an alert counselor hopped in the Cove Boat to be in attendance when the “engine” finally ran out of steam. Dimitri was up for 51 seconds, a new waterskiing record at PIC. He returned to the island in the Cove Boat triumphant but humble and ready for the next adventure. Well done, Expedition Camp 2016 and Dimitri! This article was published in the 2017 Winter Edition of the Pine Needle. This entry was posted in News from Camp, The Pine Needle, views from camp on March 27, 2017 by Pine Island Camp.